1. Product InformationProduct Category: Screw Drivers StationItem: Screw Drivers Station (Implant Drivers Station)Country of Origin: Taiwan 2. SpecificationMaterial: Stainless SteelColor: Silver 3. 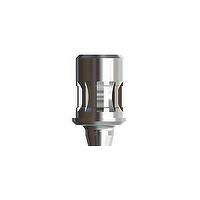 Features 1.Coordinated with 8 implants: NOB ITI AST 3i CAM ANK FRI SPI 2. 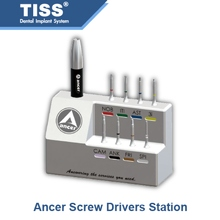 Easy classification:8 drivers with 8 color code 2.Surface Treatment:Anodized Our product includes:“TISS” dental implant system“TISS” GBR-S“Ancer” anchorage screw“Ancer” implant driver station“Titan” for Cad / CamDental hand instrument (For dental technicians) Thank you for checking this product.If you have further questions or problems, please feel free to contact us by the following information.Ms. Mindy ChenE-Mail: sales@hlbiotech.com There are more products on our official website.Please visit http://www.huangliangbiomed.com/default1.aspYou can search more relevant products on the website.Hope we can provide our service for you soon. 1. Product InformationProduct Category: SpacerItem: Spacer (Spacer)Country of Origin: Taiwan 2. SpecificationMaterial: TitaniumColor: Silver 3. Features* There have 4 screw thread pitches, according to the different implant brand to choice the pitch. * It can be matched with most implant brand on the market ( M1.4 /M1.6 / M1.8 / M2.0 ) Thank you for checking this product.If you have further questions or problems, please feel free to contact us by the following information.Ms. Mindy ChenE-Mail: sales@hlbiotech.com There are more products on our official website.Please visit http://www.huangliangbiomed.com/default1.aspYou can search more relevant products on the website.Hope we can provide our service for you soon. 1. Product Information Product Category: Multi Handle Item: Multi Handle (Multi Handle) Country of Origin: Taiwan 2. Specification Material: Titanium Color: Silver 3. Features * The mobile phone instrument is converted into torque wrench with hand instruments (For moto transfer to manual) Thank you for checking this product. If you have further questions or problems, please feel free to contact us by the following information. Ms. Mindy Chen E-Mail: sales@hlbiotech.com Tel: +886-7-6955678 Fax: +886-7-6955555 There are more products on our official website. Please visit http://www.huangliangbiomed.com/default1.asp You can search more relevant products on the website. Hope we can provide our service for you soon. HUANG LIANG Biomedical Company develops medical devices by using CNC turning and milling skills. 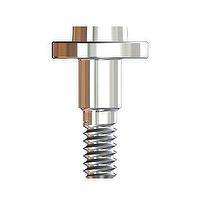 Our main products are dental implant system, anchorage screw, dental surgical tool and so on. TISS dental implant is our OBM system (Own Branding & Manufacturing). It is an excellent solution for patients, dentists and dental technicians. We supply the best implant design and completed replacement in this system. We have ISO13485 & CE certificate. Now It 's time to promote TISS to the global market. You will have a big smile with TISS implant.